What is the greatest threat to Western civilization today? In 2010, a journalist put that question to a leading European official, Herman van Rompuy. It was a crisis moment for Europe: just weeks earlier, anti-austerity insurrections had broken out in Greece and Spain, while in Italy an elected government had been replaced by a set of cardboard technocrats dispatched by Brussels. Curiously, however, “populism” was publicly embraced a few years later by none other than the undisputed leader of the West: Barack Obama. Speaking to journalists in 2016, Obama addressed the advent of Donald Trump, a figure regularly portrayed in the press as an avatar of “populist” politics. But Obama had a different view: “I’m not prepared to say that some of the rhetoric that’s been popping up is populist,” Obama said. The two examples illustrate a longstanding existential difference between European and American definitions of populism. Europeans tend to associate the term with everything politically odious. When asked to conjure an image of populism, contemporary continentals see youngsters brandishing red-brown flags, equipped with glistening jackboots and a thirst for totalitarian terror. In the run-up to the recent German election, for example, the p-word was deployed against both the far-left party Die Linke and the far-right formation Alternative for Germany (AfD), while the winning candidate, Chancellor Angela Merkel, styled herself the “anti-populist” candidate. Liberal commentators have been strident in their descriptions of the trend. To Princeton political scientist Jan-Werner Müller, the rise of populism is not just a danger or a threat; to his mind, it represents a “degraded form of democracy” that Western societies need to rid themselves of as swiftly as possible. Former Belgian prime minister Guy Verhofstadt, a leading figure in EU politics, is less oblique. In his view, populism heralds nothing less than the start of “a new world war.” It’s a long away from Obama’s lament. American and European elites are now converging on an intrinsically pejorative understanding of the term, with think pieces and op-eds on the dangers of the p-word now forming an obligatory portion of every news cycle. Still, this negative consensus seems rather less absolute on the American side. American leftists seem to have few qualms about labeling Bernie Sanders “a progressive populist.” On the other hand, Jeet Heer, a writer for the New Republic, calls that ascription a “fundamental lapse of judgment.” In a 2016 election debate, Cornel West deemed it a fatal mistake to label someone like Trump a “populist.” Unlike their European counterparts, the American commentariat remains hesitant to attach an exclusively pejorative conception of the term. If Barack Obama — a stern opponent of Brexit and supporter of the stillborn transatlantic free-trade treaty — feels that Europeans have a misplaced definition of populism, something must be amiss. The fact is, historians and journalists have been quibbling over the exact meaning of the term populism — and who should and shouldn’t qualify as one — for at least sixty years. A lack of historical analysis has allowed the term populism to retain a plasticity rivaled by few other concepts. According to recent reports, the word was used no less than a million times in journalistic publications in the years 2014–16. Essayists declare that we’re living a “populist nightmare,” while academic journals compete in what can only be called a mini-industry. Meanwhile, what’s actually meant by the word populist remains anyone’s guess. One antecedent seems inevitable: the original, late nineteenth-century Populist movement that swept the Southern and Western states in the 1880s and 1890s. What — and, most importantly, who — did this original Populist movement stand for? Its progenitors, including agrarian cooperatives, trade unions, and Granger clubs, can be traced back to at least 1877. Drawing on the Greenback and Jeffersonian strands in American political thought, they revolted against low grain prices and currency scarcity, while also defending the cause of industrial workers. The movement rapidly gained traction in the last twenty years of the century. In the 1880s, American farmers developed a vast and intricate social movement organized around the Farmers’ Alliances, and in the early 1890s these Alliances crystallized into the newly formed People’s Party. Its 1892 Omaha Platform called for the nationalization of the American railroad system, the centralization of federal monetary policy, and the burial of post-bellum rivalries. It also advocated the “democratization” of the federal government, in which the state apparatus would be handed back to who Populists considered to be its legitimate owner — the people. We meet in the midst of a nation brought to the verge of moral, political, and material ruin. Corruption dominates the ballot-box, the Legislatures, the Congress, and touches even the ermine of the bench.… The fruits of the toil of millions are boldly stolen to build up colossal fortunes for a few, unprecedented in the history of mankind; and the possessors of those, in turn, despise the republic and endanger liberty. From the same prolific womb of governmental injustice we breed the two great classes — tramps and millionaires. It was in the Southern states that the Populists faced their mightiest and most ruthless opposition. Their efforts to unite black and white tenant farmers against local landlords and merchants were met with violent resistance on behalf the landed elite, which had a stranglehold over Southern commodity markets. Anti-Populist tactics were not particularly sophisticated, in any region. In the 1896 election, for example, Eastern banks sent representatives into Midwestern towns, warning farmers that their homes would be foreclosed on if they dared elect Populist lawmakers. In the South, even more primitive instruments were used: Southern Democrats fought off the Populist threat with physical intimidation, alcoholic bribes, and stuffed ballot boxes. In desperation, Populists started looking for help within the established parties themselves. 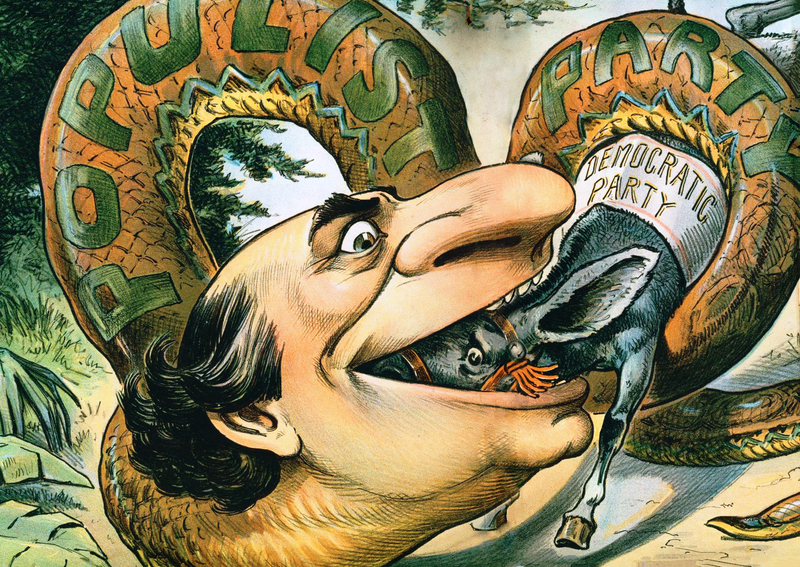 In 1896, the Democratic Party co-opted the Populist platform by nominating William Jennings Bryan, a proponent of “free silver” (a relatively moderate inflationary policy) for president. After bitter debate, the Populists decided to put Bryan’s name on their own ticket rather than run a candidate against him. After Bryan’s loss to the Republican William McKinley, the party disintegrated. Most of its cadre would go on to join other political formations, such as Eugene V. Debs’s American Socialist Party. Some, however, chose more politically divergent routes. It’s here that the origin of our transatlantic story comes to the fore. The producerist coalition of the 1890s had always been a rather broad church, attracting political cranks of all stripes, such as the Minnesota writer Ignatius Donnelly, who claimed that the unacknowledged author of Shakespeare’s plays was, in fact, Francis Bacon and who firmly believed in the existence of a land named Atlantis. But Populist eccentricity could also assume more sinister forms. The most explicit case was that of the Georgia Populist Thomas E. Watson. Watson’s biography reads like a quintessential Southern epic. The son of a Southern slave-owner, the young Watson had spent his youthful years in dire poverty due to the devastation wrought by the Civil War. His father lost his plantation and spent the rest of his days mired in depression and paralysis. Predictably, Watson’s youth was suffused with talk of the Lost Cause and haunted by the memory of great Southern statesmen: John Calhoun, Robert E. Lee, Thomas Jefferson. But Watson was no ordinary apologist for the plantocracy. Like his hero Thomas Jefferson, Watson was fascinated by the French Revolution and saw himself as a defender of the commonwealth against aristocratic prerogative. Although a proud Southern secessionist, he later abandoned the Democratic Party because of its collusion with the “moneyed interests” and joined the third-party crusade in the late 1880s. As a Populist organizer, Watson helped broaden the Populist appeal across race and gender lines. In the 1890s, he came out as an opponent of lynch laws, championed black voting rights, and lauded the influx of women in the movement. This more inclusive side of Populism was not viewed kindly in a South riven by racial animosity. The year 1892 witnessed some of the most vicious campaigns of racist violence in Southern history, many of them directed at Populist organizers. In May 1892, for example, Watson had to rally his supporters to ride to the protection of the black Populist preacher H. S. Doyle, who had received threats from Democratic opponents in the run-up to the presidential election. His call was swiftly heeded. Over two thousand agrarian followers congregated at Watson’s Georgia mansion, staying the night to fend off possible Democratic attacks. But Watson’s racial liberalism was not to last. A fervent supporter of black voting rights and progressive political causes in the 1890s, Watson morphed into a race-baiting fanatic after Populism’s defeat in 1896. In the 1910s, he fulminated against “Jewish billionaires” in his magazine The Jeffersonian and staunchly advocated the disfranchisement of blacks in Southern states. As such, he helped to codify the new Jim Crow. As the twentieth century entered its second decade, Watson’s political temperament turned progressively sourer. In the notorious Leo Frank case of 1913, he played an instrumental role in summoning Southern mobs to lynch the Georgia businessman, who had been unjustly accused of murdering one of his underage hirelings, the thirteen-year-old factory girl Mary Phagan. Watson’s anticapitalism now assumed an overtly reactionary form. While he himself had pleaded for several Jewish clients in the early 1900s — even claiming, as a public defender, that “no Jew can do murder” — he now came to identify the “Hebrew menace” as a threat to his republican vision. It was a startling turnaround. Yet even in the darkest days of his political career Watson showed flashes of his earlier radicalism. In the wake of Woodrow Wilson’s anti-communist witch hunt, Watson called Eugene V. Debs “one of the greatest, truest, purest Americans now alive.” He even voiced support for the Bolshevik government. To Watson, Wilson’s US war plans were a conspiracy “to prevent Russia from showing the world how a democracy may be established — thus setting a bad example that may ‘infect’ other submerged masses.” In a further twist, Watson defended Rosa Luxemburg and her comrades in the German Revolution, and opposed a bid by Henry Ford for the US Senate on the grounds of Ford’s antisemitism. A similar story played out in in the Scopes “Monkey Trial” of 1925, in which former Populists played the starring roles for both the defense and the prosecution: William Jennings Bryan of Nebraska, who defended Tennessee’s ban on teaching evolution, and Clarence Darrow of Illinois, who opposed it. Again, former allies now found themselves on the opposite side of the political spectrum. It would seem, then, that widely divergent avenues were open to ex-Populists. One could become a socialist agitator who made key overtures to Southern blacks. One could also become a nativist patriarch who at times exhibited clear Hitlerite tendencies. An exclusionary and an inclusionary populism could easily exist side by side. Historians have repeatedly found themselves perplexed by the Jekyll-and-Hyde-like paradoxes of Populist thought. How could a man committed to biracial organizing in the 1890s turn into a whitecapping state boss in the 1910s? European interpreters have tended to focus exclusively on populism’s darker side. In his latest book, Jan-Werner Müller relies on Watson to construct a story of “exclusionary” populist logics. “Populism,” Müller notes, “is always and everywhere antipluralist” and “always ends in exclusion.” In short: never Debs, always Watson. Where does this pejorative vision originate, and why does it seem to carry less weight in America? Although several hypotheses have been put forward, by far the most plausible traces this negativity to the rather partial readings of the original Populist movement offered by American historians of the 1950s — and one major historian in particular: Richard Hofstadter. These Cold War-era accounts painted a picture of Populism as inherently conspiratorial and proto-totalitarian. As Hofstadter saw it, populists exemplified the “paranoid style in American politics,” with mad ravings against the “money power” and a proclivity for racial phobias. Together with Cold War intellectuals like Daniel Bell and Seymour Martin Lipset, Hofstadter drew a straight line from big-P Populism to American McCarthyism, arguing that both traditions share the same a pedigree. Hofstadter’s vision is best understood in the context of his time. For a long time, American historians had looked fondly on the Populist episode. In the 1920s, Progressive historians like John Hicks and Vernon Parrington cast the populists as the last representatives of the great Jeffersonian tradition. In these accounts, the Populists were the last bulwark against corporate capitalism, maintaining the settler spirit and fighting the United States’ drift from republic to empire. In the 1940s, this vision still reigned supreme. Marxist historians like Anne Rochester and Chester McArthur Destler, for example, found a distinct brand of American radicalism in populism: it was the socialist movement the United States never had. When writing these words in 1956, Bell could pride himself on newly acquired evidence. In 1955, Hofstadter published The Age of Reform, in which he painted a schizophrenic portrait of the turn-of-the-century Populist farmer. was in the past, not the future.… The Populists looked backward with longing to the lost agrarian Eden, to the republican America of the early years of the nineteenth century in which there were few millionaires and, as they saw it, no beggars, when the laborer had excellent prospects and the farmer had abundance, when statesmen still responded to the mood of the people and there was no such thing as the money power. This nostalgia could also take less innocent forms. Hofstadter claimed the Populists were essentially antisemitic and had activated much of the anti-Jewish sentiment in the Gilded Age. In their ravings against the “money power,” they often slid into racial stereotyping, blaming the United States’ financial ills on the “evil Rothschilds.” The fact that Tom Watson himself became the main instigator in the Leo Frank case only further proved his point. Hofstadter’s thesis immediately faced objections. The debate, often referred to as “one of the bloodiest episodes in American historiography,” lasted over twenty years, eventually involving historians such as Walter Nugent, John Hicks, and Comer Vann Woodward, all of whom wrote passionate defenses of the Populist movement. This quickly led to some embarrassing conclusions. Many of Hofstadter’s claims — that the Populists were antisemitic; that they provided the social basis for McCarthyism — turned out to be empirically unjustifiable. Nor could Hofstadter explain the career of many later Populists, who joined European Jews in the American Socialist Party and became fierce critics of Henry Ford’s bigotry. The claim that most former Populist states had become seedbeds of McCarthyism — one of Hofstadter’s key arguments — also turned out to be false. Hofstadter and his colleagues saw that most ex-Populist states strongly supported the Wisconsin Senator. Yet, as political scientist Michael Paul Rogin pointed out in 1967, partisan Republicans were most likely to support McCarthy while working-class voters could be classed as lukewarm anti-communists at best. By the end of the 1960s, Hofstadter’s thesis was in tatters. Empirically dubious and politically elitist, few academics still believed in his argument. Even Eric Foner, one of his doctoral students, has declared that his supervisor was wrong from beginning to end. But academe is not the assembly. As Jeet Heer pointed out in a recent piece, Hofstadter has had a curious legacy. On the one hand, American historians attribute little importance to the actual content of his work on Populism. In academic circles, the idea that the Populists were the McCarthyites’ forebears “languishes in ruin,” as the historian of Populism Lawrence Goodwyn once put it. In public consciousness, however — and certainly in European debates — the Hofstadter thesis is alive and well. It’s hard to find a contemporary pundit who doesn’t see populism and proto-fascism as implicit synonyms and who doesn’t cast the late-nineteenth-century Populists as first-class bigots. Thanks to modernization theory’s influence in the 1960s and 1970s, this vision also had a strong effect on European debates. By the end of the 1960s, populism was on every political scientist’s lips. Its heritage, however, remained problematic — as became even clearer in 1968. Around that time, two English historians decided to organize a conference at the London School of Economics. A variety of researchers attended: Isaiah Berlin, Ernest Gellner, Ghita Ionescu, and — most interestingly — Hofstadter himself. At the end of the conference, Hofstadter joined the conversation. He started his speech by admitting that he was slightly dazzled by the wide range of movements classified as “populism”; he had expected nothing but a discussion of Russian and American variants. He also conceded defeat in the revisionist controversy — the “genetic affiliation” between McCarthyism and “earlier agrarian movements” was “doubtless miscarried,” he said. Even if the John Birchers and other “paranoid-style” politicos did “twang some populist strings,” they no longer qualified as “substantial” populists. This confession, however, did not stem the concept’s rise in European academia. While Hofstadter admitted his mistakes, European political scientists became even more enthusiastic about his version of small-p populism. In the 1980s, Hofstadter’s thesis gained further traction in European political science departments, most interestingly in France. In 1984, in a text called “La rhétorique du national-populisme,” the French political scientist Pierre-André Tagueiff introduced the term “national-populism” to describe the far-right National Front (FN). Taguieff relied on Daniel Bell and Richard Hofstadter for his new definition, which, in his opinion, better described the party. In this influential yet little-known text, Taguieff referred to the “new style” of the FN, which had experienced a rejuvenation after the failures of the Mitterrand administration. The FN itself — still composed, at the time, of Vichy nostalgics, ultranationalists, and Algerian war vets — initially rejected the term. Swiftly, however, Taguieff’s neologism established itself in media circles. Over the course of the 1980s, a number of French political scientists began using populism both as a normative epithet — describing the phenomenon “dangerous” and “deplorable” — and a neutral description. In effect, they transformed the FN from a fascist party to populist one. Journalists embraced the innovation enthusiastically. Not only did Taguieff’s invention offer them a new discursive plaything, but it also lent their analyses a fake neutrality, different from the semantic overkill associated with terms like fascism or the extreme right. In “national populism,” there are two words — “people” and “nation” — which, in my opinion, are indissolubly linked, and to which I am profoundly, viscerally attached.… National-populism carries its name with pride. It is a profoundly, authentically popular phenomenon. Taguieff’s opponents noticed an emerging paradox. A term originally coined to discredit a neofascist party had become one of its most effective weapons. In the eyes of some, Taguieff had done the FN a costly favor, helping them in their transformation from Vichy fan club to socially acceptable opposition party — one that would eventually capture a considerable part of the French electorate. Despite its ambiguous connotations, the word populism has always been more acceptable than labels like racist or extreme right — terms still met with considerable opprobrium in the early 1990s. In that decade, journalists applied the word populism to almost every political movement and leader under the sun: the National Front, the Flemish Vlaams Blok, French multimillionaire Bernard Tapie, the Austrian Jörg Haider, the American Newt Gingrich — a virtually endless list. Accordingly, the original Populists were quickly buried under three decades of ideology. Americans now find it difficult to convince Europeans that it once signified something other than pure demagoguery and proto-fascism. The core claim of populism is thus a moralized form of antipluralism. . . . Populism requires a pars pro toto argument and a claim to exclusive representation, with both understood in a moral, as opposed to empirical, sense. There can be no populism, in other words, without someone speaking in the name of the people as a whole. Populism proclaims that the will of the people as such is supreme over every other standard, over the standards of traditional institutions, over the autonomy of institutions and over the will of other strata. Populism identifies the will of the people with justice and morality. It seems that, even after many a summer, the Hofstadterian swan will not die. The ahistorical state of contemporary populism studies mirrors the treatment the term is given in European political commentary. Jean-Claude Juncker and European President Donald Tusk, for example, can now proclaim their commitment to a united Europe under the banner of an ecumenical anti-populism. We need not claim that Hofstadter is wholly responsible for this negative perception of populism. Such a contention could, in a more sinister vein, lead to the argument that an evil “cultural Marxist” besmirched America’s radical heritage, leading to a “personalization of historical developments,” as Moishe Postone has put it. Rather, we should ask a different question: why has so little changed in populism studies? Why does a concept that was declared bankrupt by its very inventor still have such a stellar career? When writers such as Cas Mudde, Jan-Werner Müller, and Pippa Norris continue to describe populism in ways eerily similar to Hofstadter’s definition, we should wonder why this particular vision of the movement has proven so successful. To some, it simply demonstrates the power of ideas in historical processes. To others, it should stand as a call for self-examination. Anton Jäger is a doctoral student at Cambridge University.